The Clan crest is surrounded by a detailed belt and buckle design upon which is inscribed your Clan motto in raised relief lettering. In ancient times, the Chief of the Clan presented to his Clansmen his crest for them to wear as a symbol of their loyalty and Clan affiliation. Each piece is exquisitely handcrafted in high detail in high quality fine pewter, sterling silver or karat gold. The Clan Crest is 11/16" (19.5mm) in diameter. 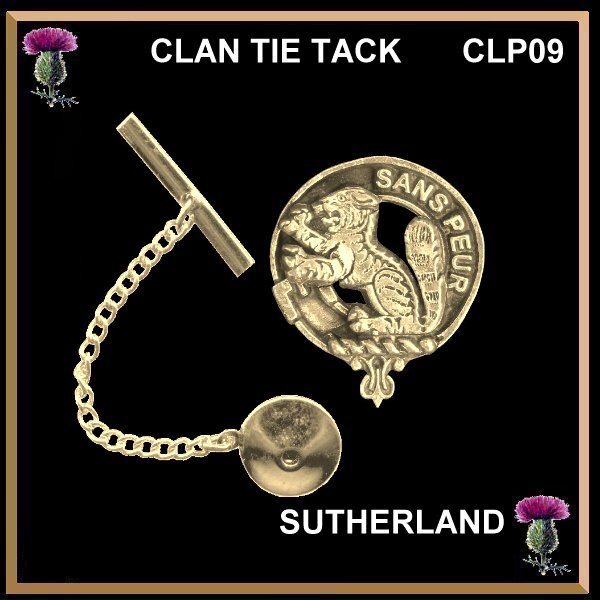 The Clan crest tie tack is complete with a high quality nickel silver clutch with chain. This is a versatile piece that can be worn as a tie tack or on the lapel of a coat.